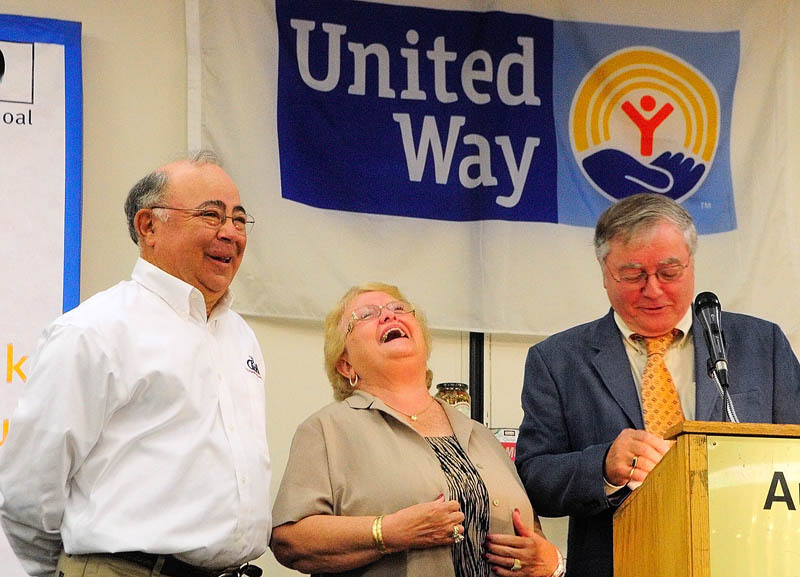 About 270 volunteers and business leaders attended the annual breakfast at the Augusta Civic Center, where United Way leaders said they hope to rebound after a few tough years of fundraising. AUGUSTA — With a brush dipped in red paint, Dorcas Riley marked halfway up the fundraising thermometer to signify reaching 49 percent of the United Way of Kennebec Valley’s goal of $1.5 million for its annual campaign. “A generous 49 percent,” joked Rob Gordon, executive director of organization, while standing at a lectern Wednesday with Riley, chairwoman of the campaign. 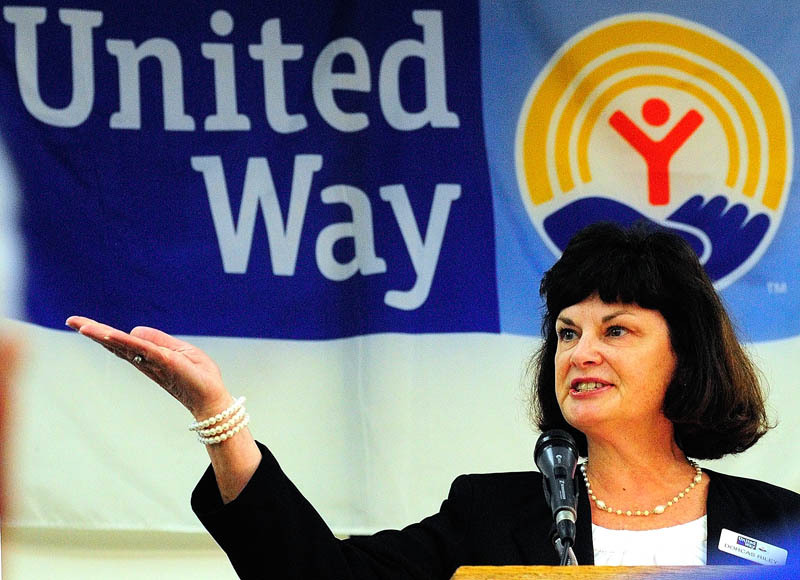 Wednesday’s breakfast, attended by about 270 volunteers and business leaders at the Augusta Civic Center, served as the kickoff for the United Way of Kennebec Valley’s annual campaign held each fall. The organization, which gives to more than 50 local programs that help people in need, hasn’t surpassed its $1.5 million fundraising goal since 2007. Gordon said he hopes they can do it this year and expects to reach beyond it in future years. Charitable giving dropped significantly in the U.S. in 2008 and 2009, from an inflation-adjusted high of $344.48 billion to around $300 billion, according to a 2013 report by Giving USA Foundation and the Center on Philanthropy at Indiana University. Total charitable giving has increased since then, but only to $316.23 billion in 2012. The report estimates it will take at least six years to reach the high of 2007, adjusted for inflation. United Way of Kennebec Valley has seen a similar trend. The totals generally have been increasing since 2009 but haven’t returned to pre-recession levels. In 2012, it recorded about $1,435,000 in donations, Gordon said, an increase from its recent low point of $1,237,000 in 2009. He said the organization heard from some people in 2008 and 2009 who couldn’t afford to give as much. Most of the organization’s fundraising came from payroll withdrawals from participating businesses — about 80 percent, Gordon estimated — so fewer workers meant fewer employees giving to United Way. The owner of one of the companies with the highest contributions to the organization, Charlie’s Family of Dealerships, and his wife were honored at the breakfast with the annual Norm Temple Award for their personal contributions to United Way. Several volunteers and employees at other nonprofits stood up to thank Charlie and Nancy Shuman at the breakfast on Wednesday for their support of various causes. Deborah Shepherd, executive director of the Family Violence Project in Augusta, thanked Nancy Shuman for her donations of clothing. Both Charlie and Nancy Shuman said they were surprised and thankful to be honored. He said he tries emphasizing to his employees the importance of charity. Shuman said after the event that when he opened the business 27 years ago with seven employees, he planned to give back to the community if he became successful. The United Way of Kennebec Valley’s annual campaign usually runs from August through November, but Gordon said they’re always fundraising and reaching out to new businesses. The next big event is a party for the organization’s leadership circle — those who donated $600 or more — at the MaineGeneral Alfond Center for Health, the new Augusta hospital scheduled to open in November.